Today I bring to you a rather special watch made by watchmakers Richard and Maria Habring, the couple behind the independent brand Habring². It is their Doppel 2.0, the genesis of which lies a couple of decades ago when Richard Habring was at IWC and created the world’s first affordable split-seconds chronograph, the IWC Doppelchronograph. This particular Doppel 2.0 is of special note, and I shall reveal why after a brief historical ramble. Richard Habring created the world’s first affordable split-seconds chronograph by adapting the workhorse Valjoux 7750 movement. Why was this revolutionary? Because he democratised the ability to time two events with the same chronograph, which had previously been a far more complex and pricey watchmaking affair. 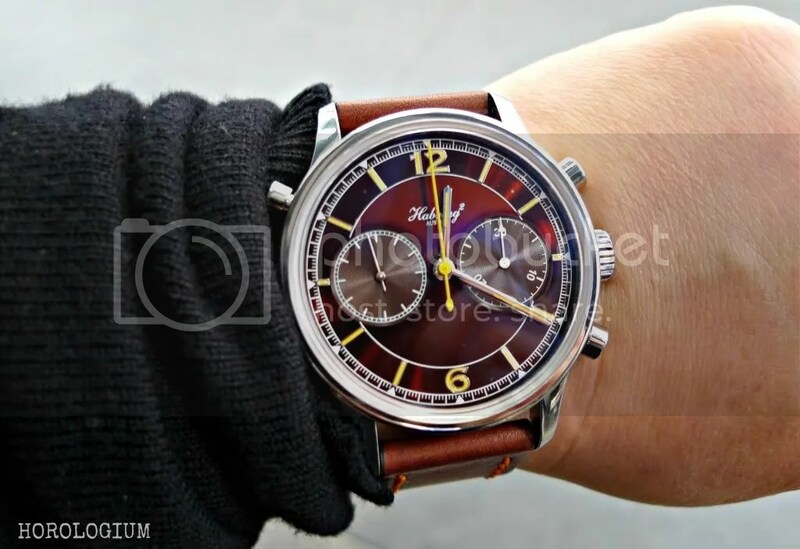 A basic chronograph keeps track of elapsed seconds, minutes and sometimes hours, through the use of pushers. Upon activation, the seconds hands starts. With a double chronograph, the centre seconds hand is overlaid by another hand which moves simultaneously. In order to time a second event, the user presses the pusher on the left side of the case which stops the second sweep hand, thereby displaying the elapsed time instantly whilst the main seconds hand continues to run until stopped. Pressing the left-side pusher again causes the stopped hand to catch up to the running seconds so that they move in unison once more. IWC filed for the patent on this invention twenty years ago, but with the expiration of the doppelchronograph patent, Richard Habring has now been free to build on his own creation. First of all, the Habring2 Doppel 2.0 looks different to the IWC doppels, with a dual register layout instead of a tri-compax. The seconds are on the subdial on the left, elapsed minutes on the right. The third chronograph pusher for the ‘doppel’ aspect is at 10 o’clock. The 2.0 is also a much more dressy and modern looking watch than its Schaffhausen predecessor, with its very clean radial minute markers and an outer seconds track. At 42mm in a stainless steel case it is a decent size, but sits quite discreetly on the wrist. So what is inside? It’s the Habring2 calibre A08MR, still based on a Valjoux 7750 with the dial layout change, and a simplified bridge-layout to improves accessibility for servicing. It has 23 jewels and a 48 hour power reserve. When the Doppel 2.0 was launched, it was announced that the dial was available in three options – galvanised blue, brown or slate gray. However, this particular Doppel is one of only two watches with this colour, the dial colour harking back to 2007. The Habrings call it “transparent brown”, but in looking at it, the colour is hard to pin down; it’s definitely brown, but with hints of burgundy. 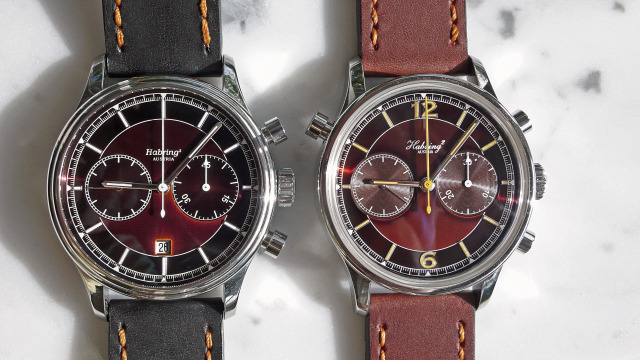 The ‘limited edition of 2’ Doppel 2.0 and the Chrono SHH 2007 can be seen side by side below for a colour comparison. The other major difference between this customised Doppel 2.0 and the production models are that the rhodiated hour numerals and markers are orange, as per the 2007 model, rather than just rhodiated. They are, however, still coated with Superluminova, like the other 2.0s. 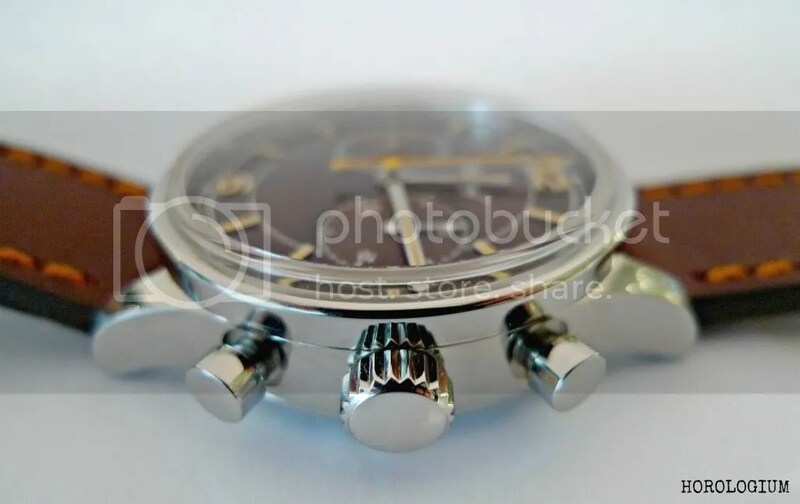 This watch is number 2 of 2 (and engraved as such between the bottom lugs), its owner already the owner of a Habring2 jumping seconds with power reserve. His first purchase from Richard and Maria Habring had been inspired by their chronograph launched half a decade ago, but his thoughts as to what to choose for his second Habring2 was decided with the announcement of the 2.0. He knew that he had to have it. The watch game was on. The first hurdle was that the particular burgundy dial colour that was used in 2007 and which he wanted was not easy to reproduce, with the subsequent developments in technology and methodology used by the Habrings. The ever friendly and helpful Richard and Maria scoured through their old records to attempt to recreate this colour, and they managed to achieve something although not exactly the same, still pretty close to the original. The dial gives off quite different effects under different lighting conditions and at different angles. In fact the same applies for its owner’s other Habring², which has a similarly dynamic and fluid dial, though it is more chocolate brown. I mentioned earlier that this watch is ‘2 of 2’. How is this so? The online watch community, most commonly represented on the various fora, is a rather sociable one, with many friendships developed over this shared interest. A series of email exchanges between ‘2 of 2’ and a watch friend lead to the realisation that they both wanted this watch, and in the same (unavailable) dial colour. They approached Maria and Richard, and the Habrings (happily) agreed to make this very special edition just for them. 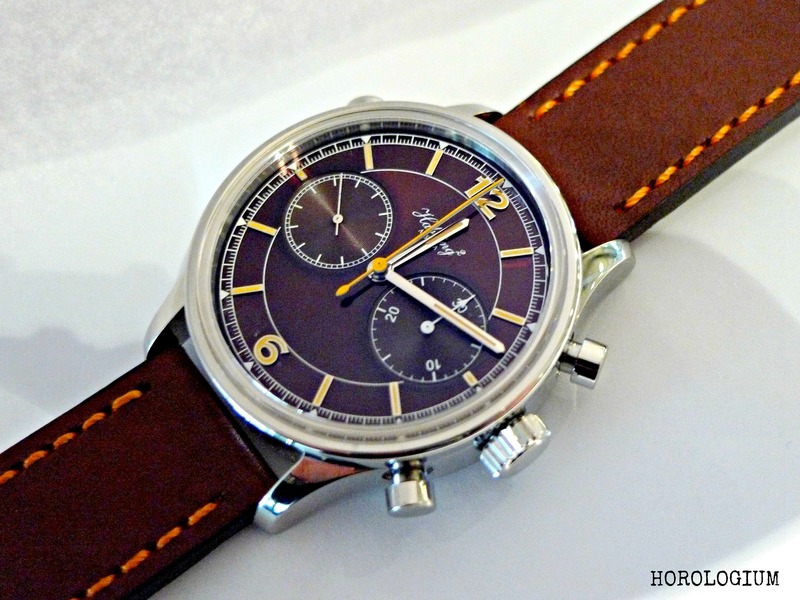 The Habring2 Doppel 2.0 costs 6,000 Euros. For more information or to order, go to Richard and Maria’s website. Rather than their usual twelve per model per annum production rule, production of the Doppel 2.0 has been increased to twenty per year to commemorate the 20 year anniversary of the original design and patent of the split second chronograph mechanism designed by Richard. 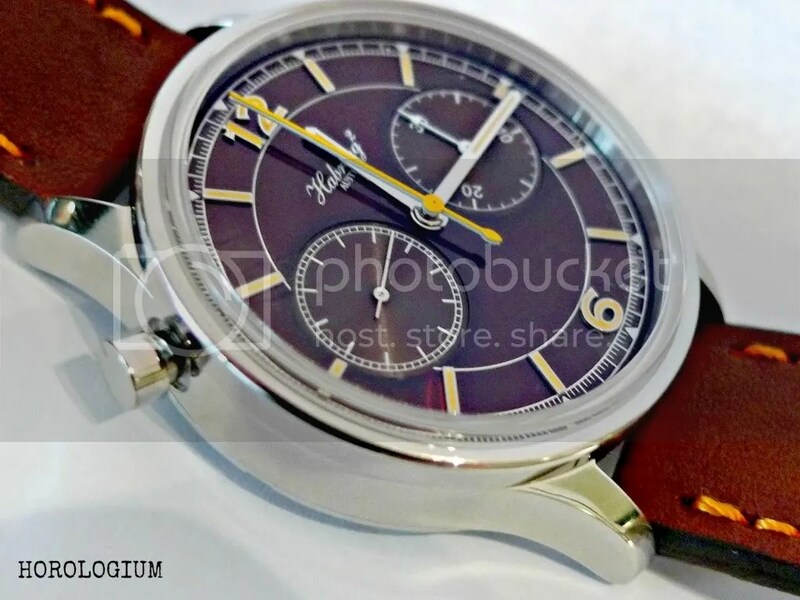 ADDENDUM : 3 June 2013 – Define Watches of Brisbane is going to be Habring’s exclusive dealer in Australia as of this month. A great ‘scoop’ – congratulations, and thank you for the pithy review. Great article and a very interesting watch. 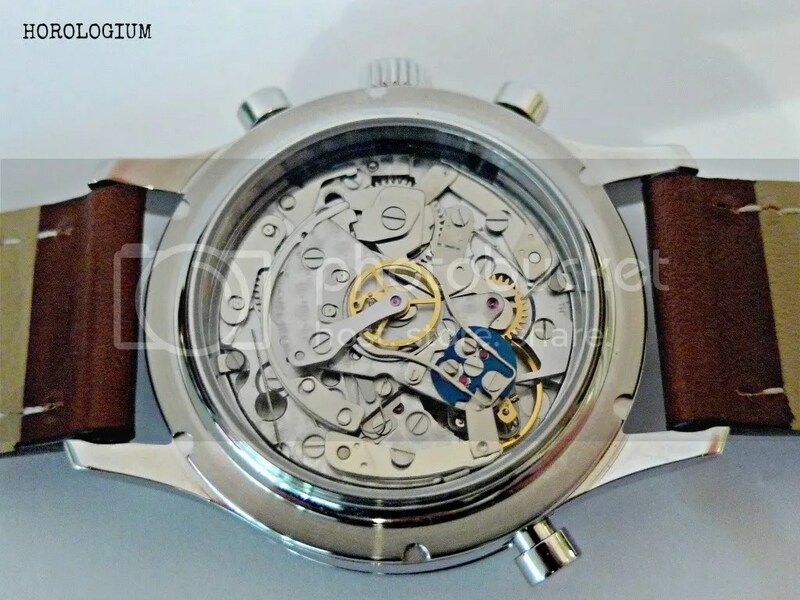 I really like the case and dial but I also kinda wish their would be some better finishing on the movement itself but for the complication it features and the asking price it’s still nevertheless superb value.